The Composition Court (also known as Carpet Court) is a tennis court from the Nintendo 64 game Mario Tennis, as well as the Game Boy Color game Mario Tennis, Game Boy Advance game Mario Tennis: Power Tour and Wii U game Mario Tennis: Ultra Smash. This court is where the varsity-ranked players play. After Alex, Nina, Clay and Ace play here, they move up to play at the Island Open. The Composition Court makes its debut in Mario Tennis as a Blue court with a very fast ball speed, despite having normal bounce. 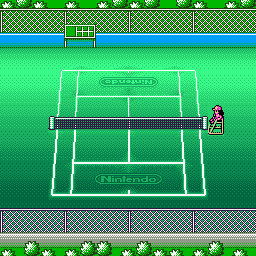 The Composition Court makes a second appearance in Mario Tennis, as the court used by the varsity ranked players. It is only played on once in the story mode, but can be chosen from the exhibition mode at any time. It has the fastest ball speed with a normal bounce. 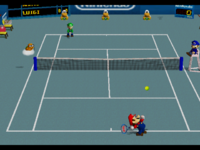 In Mario Tennis: Power Tour, when players are on this court, it is mentioned that the tennis ball travels faster than it does on any other court. The ball's bounce height, however, is normal. Like Mario Tennis, it is where the varsity-ranked players play. 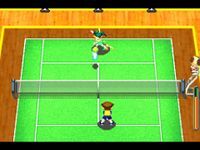 In this game, it is a green, indoor court with a surrounding miniature, white fence that runs along a yellow floor. Also, there are windows facing the court in. This page was last edited on June 28, 2018, at 15:29.